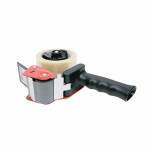 Q-Connect Carton Sealer KF01295 Pack of 1 Q-Connect Packing Tape Dispenser. 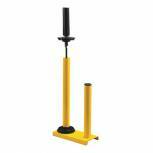 High quality lightweight plastic and steel pistol grip dispenser with fully adjustable brake. Designed for durability while minimising operator fatigue. Suitable for use with tape 50mmx66m. 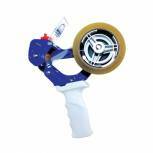 Sellotape Premium Hand Case Sealer with Brake 503978 Pack of 1 Sellotape Premium Hand Case Sealer with Brake will use a roll up to 50mm wide and 132m long. 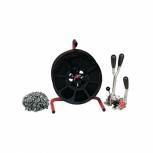 Durable metal construction with easy grip handle. Pack of 1. Flexocare 2 inch Heavy Duty Tape Dispenser 74SL7326 Pack of 1 These attractive units feature a multi-core facility enabling more than one width of tape to be used together. Also featured is an in line guide to stop tapes overlapping when in use. 2 width. Scotch Pistol Grip Dispenser With 2 Rolls KT000037533 Pack of 1 Scotch Pistol Grip Dispenser with 2 Rolls LN5066R21. Comes with 2 rolls of 50mm x 60m buff low noise tape. Solvent-free adhesive. 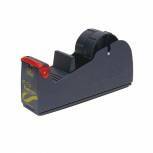 Safety Tape Dispenser With Retractable Blade 74PD1083 Pack of 1 This high quality metal unit features a retractable cutting blade that only comes into operation as the tape is being cut, once cut the blade automatically retracts. 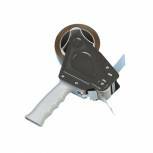 The brake facility ensures easy use with all types of 50mm tape. Universal Stretch Wrap Dispenser 422 Pack of 1 Free-standing metal Stretchwrap dispenser. Accepts 400mm or 500mm Stretchwrap on 38mm, 50mm or 75mm cores. 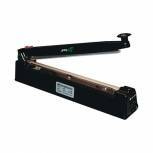 Impulse Heat Sealer Standard 15 inch 89SP1S400 Pack of 1 Ideal for machines for sealing either polythene bags or polythene lay flat tubing. CE approved. All machines come with 2 spare Teflon covers and heating elements. 15 standard model. 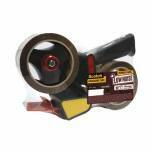 Flexocare 2 inch ComFort Grip Tape Dispenser 74SL2163SH Pack of 1 An economy model pistol grip tape dispenser, which features a special foam covering on the handle to provide a comfort grip. Suitable for use with all 50mm tapes. 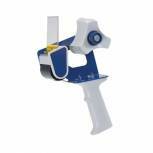 White Strapping and Film Cutter Tool JFK 47216001 Pack of 1 Strapping and Film Cutter. A low cost solution to packaging cutting needs. Suitable for cutting most packaging film including stretch and shrink wrap, bubble wrap and strapping. 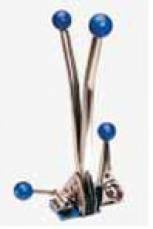 Portable Metal Strapping Floor Stand 91796001 Pack of 1 Portable Metal Strap Floor Stand. Metal stand that is simple to load and use. The handle acts both as a carrier and brake to prevent strapping running off. (Strapping not included). 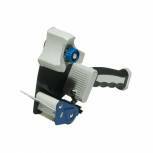 Rapesco Hand Held Carton Sealer Black TD9600A1 Pack of 1 Rapesco Hand Held Carton Sealer Black TD9600A1. Steel construction for heavy duty use. Impact resistant contoured handle. Adjustable tape brake. Position safety guide. 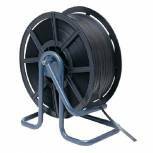 For tape up to 55mm wide and 66m long. 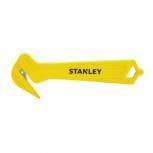 Combination Strapping Tool 12mm 891120 Pack of 1 Combination Tool. The ideal tool to secure packages, the 12mm combination tool will tension and seal packages in one easy operation. 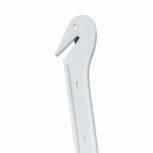 Suitable for use with 12mm open metal seals. 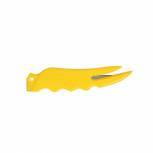 Cruze Yellow Safety Tape/Packing Cutter Pack of 1 Cruze Safety Cutter. Inbound blade cuts with ease through pallet wrap and polypropylene strapping. 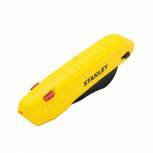 Handy box cutter pierces box sealing tape without damaging the goods contained within. 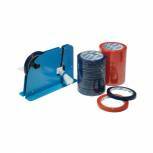 Carton Strapping Kit Complete 87110 Pack of 1 Carton Sealing Kit. Each kit contains a 12mm combination banding machine, a roll of 12mmx2000m Black strapping, 2000 - 12mm metal seals and a portable metal floor stand. (All items in the kit are available separately). 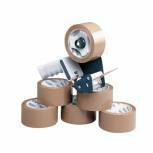 Tape Dispenser With 6 Rolls Polypropylene Tape 50mmx66m 9761Bdp01 (Pack of 6) Pack of 1 6 rolls of 50mmx66m Brown economy polypropylene tape supplied with a braked metal pistol grip dispenser.